Last Monday, BMW officially took the cover off of their 2014 2 Series at the 2014 North American International Auto Show (NAIAS). 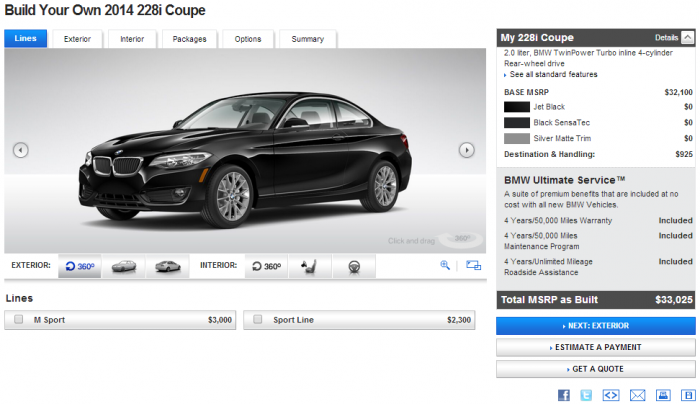 Now, those looking to get a closer look at the successor to the 1 Series have the opportunity to do so through the 2014 BMW 2 Series configurator. 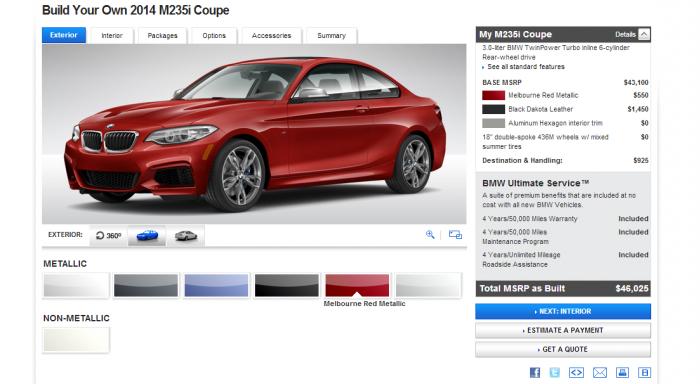 Pages for both the 2014 228i and M235i allow for fine tuning down to the most minute details. From the start, the 2014 228i Coupe offers a base MSRP of $32,100 (plus $925 destination and handling fee)—this includes a 2.0-liter BMW TwinPower Turbo inline four-cylinder engine and rear-wheel drive configuration. For an additional $3,000, you can add the M Sport package; upgrades include 18” M light alloy double-spoke wheels, M sport suspension calibration, M sport steering wheel, aerodynamic kit, rear spoiler, Shadowline exterior trim, and sport seats. An extra $2,300 will get you the Sport Line trim, which includes Anthracite headliner, door mirror caps in black, 18” light alloy double-spoke wheels, M sport suspension calibration, sport seats, and an increased top speed limiter. 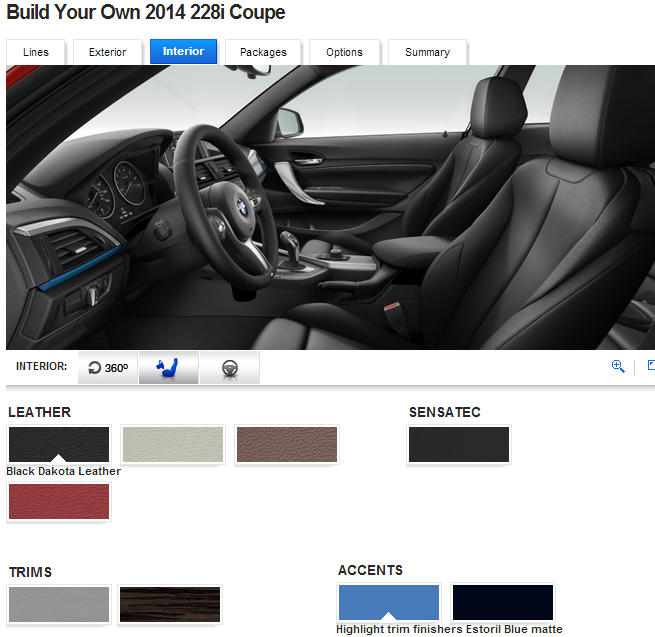 The exterior configurator lets you play with colors, including Jet Black and Alpine White (available at no extra cost), Glacier Silver Metallic, Mineral White Metallic, Deep Sea Blue Metallic, Black Sapphire Metallic, Melbourne Red Metallic, Midnight Blue Metallic, Sparkling Brown Metallic, Moonlight Silver, Mineral Grey Metallic, and Valencia Orange (costs $550 to add), and Estoril Blue (pictured, requires M Sport package). On the interior, you will be given your choice of leather seating; choices include Black Dakota, Terra Dakota, Oyster Dakota, Leather Dakota Oyster/Black with dark Oyster accent (each costs $1,450 to add); Leather Dakota Black/Red highlight and Leather Dakota Red/Black highlight (each costs $1,450 and requires Sport Line package). Sensatec seating is offered in Oyster, Black, and Black Sensatec/Red Highlight (which requires Sport Line package). Trims include Silver Matte, Fine-wood trim “Fineline” Stream ($500), and Brushed Aluminum ($500). Available accents include Highlight trim finishers in Black high-gloss, Coral Red matte, and Estoril Blue Matte (pictured). Packages for the 2014 228i include the Cold Weather Package ($700), Driver Assistance Package ($950), Dynamic Handling Package ($1,000), Driver Assistance Plus ($700), Lighting Package ($900), Technology Package ($2,150), and Premium Package ($4,050). Options include your choice of manual transmission or STEPTRONIC automatic transmission, M Sport Brakes ($650), 18” Light Alloy Double-Spoke Style 385 with All Season Tires ($600), heated front seats ($500), Concierge Services ($250), power front seats with driver seat memory ($995), Parking Assistant ($500), harman/kardon premium sound ($875), and automatic high beams ($250). With the inclusion of all the high price options, packages, and premium appointments, your highest total MSRP for the 2014 228i Coupe will be $49,550. As this is an M Sport vehicle, you don’t have the option of determining a trim line with the M235i. The M235i has a base MSRP of $43,100 (plus $925 destination and handling fee) and comes standard with a 3.0-liter BMW TwinPower Turbo inline six-cylinder engine and rear wheel drive configuration. The M235i is only offered with a manual transmission. 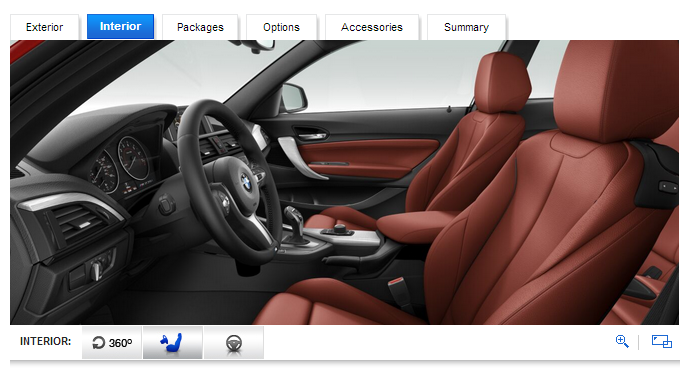 Your 2 Series configurator experience here begins with color configuration. The Alpine White non-metallic option is the only choice that will not set you back the additional $550 required for a metallic hue. Metallic paint options include Mineral White Metallic, Glacier Silver Metallic, Black Sapphire Metallic, Melbourne Red Metallic (pictured), Mineral Grey Metallic, and Estoril Blue. The interior of the M235i offers much of the same as the 228i: Leather options include Terra Dakota, Black Dakota, Oyster Dakota, and Leather Dakota Coral Red/Black highlight (pictured w/ Brushed Aluminum Trim). Sensatec comes in one color: Black. Trim comes in Brushed Aluminum, Fine-wood Trim “Fineline” Stream, and Aluminum Hexagon interior trim. Packages for the 2014 M235i include the Cold Weather Package ($550), Driver Assistance Package ($950), Driver Assistance Plus ($700), Technology Package ($2,150), and Premium Package ($2,300). Options for the 2014 M235i include 18” double-spoke 436M wheels with mixed summer or all-season tires, heated front seats ($500), Concierge Services ($250), Parking Assistant ($500), harman/kardon premium sound ($875), anti-theft alarm system ($400), and automatic high beams ($250). 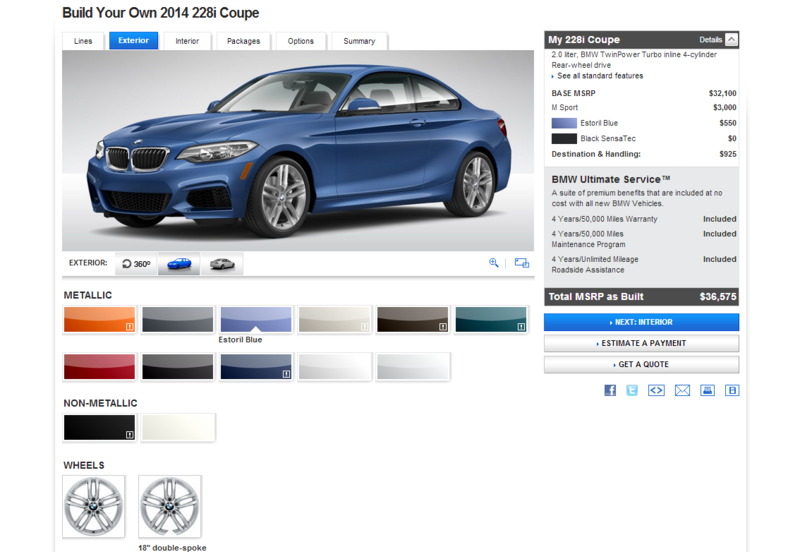 Additionally, the M235i configurator offers optional Runflat tires at no additional cost. With all available packages, options, and features, your 2014 M235i will run you a total of $53,500. All packages for both the 2014 228i and M235i come standard with BMW’s 4 year/50,000 mile warranty and maintenance program as well as a 4 year roadside assistance package.